Why Buy Alfresco From BBQGuys? For many years, Alfresco has designed and manufactured premium commercial kitchen equipment for hotels and restaurants. Today, they use that same expertise and inspiration to bring you commercial-grade outdoor kitchen equipment for residential use. Alfresco grills are proudly made in the USA with the highest quality materials for great durability. Alfresco offers a large variety of luxury built-in and freestanding gas grills. Alfresco BBQ grills are available in propane or natural gas fuel types and are constructed with 304 stainless-steel. All burners are made of a titanium and stainless-steel blend, so you know you’re buying a high-quality product. Depending on the number of people you normally cook for, you can select an Alfresco gas grill in 30, 36, 42 or as large as 56 inches. All Alfresco ALXE grills are equipped with cool-to-the-touch knobs, made possible by an air-cooled front control panel that protects your hands and the equipment from the grill’s intense heat. 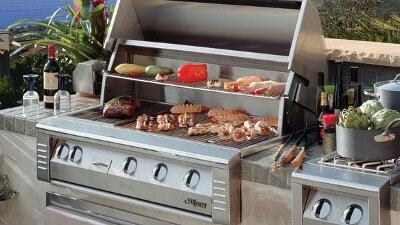 Alfresco grills come furnished with LED lights on the knobs to eliminate the guesswork during night time grilling. The spring assist hood system makes lifting and lowering the hood a snap. The unique integrated rotisserie is a super quiet, chain-driven system designed to hold up to 120 pounds of food. There is storage space under the grill for the spit rod when it’s not in use. The flush-mounted ceramic infrared rotisserie burner is included with all Alfresco grills, perfect for roasting food to perfection. The included three-position adjustable warming rack is prefect for above-the-grate cooking and warming. The rack conveniently stores out of the way when the rotisserie is being used. To get your searing done quickly, add an optional infrared main burner on your grill. The infrared main burner is also included on select built-in and freestanding Alfresco gas grills. Love real wood smoked flavor? It has never been easier to smoke on your Alfresco grill with the integrated smoking drawer or optional drop-in insert. It holds large wood chunks, liquids and herbs with a dedicated stainless-steel burner for great smoked flavor. For true cooking versatility, check out Alfresco Grill Accessories for a variety of optional add-ons. The Alfresco steamer and fryer allow you to steam, boil and fry at the same time you are grilling meats or veggies on your other burners. You can fry french fries, boil lobsters or even steam vegetables just like you would in your indoor kitchen. The possibilities are endless!